They will be ladykillers when they get older!!! They rarely sit still long enough to take a good picture and either way one of them seems to always be making a face of some kind. I have b/g twins (12 years old) . I've heard all sorts of stupid comments...and still do! My response to the "are they identical" question is just to say nope, that one is a boy and one is a girl. They always get a confused look on their face! I have twin 3 year old boys. They are fraternal. but most people think they are identical, until i point out the differences. My mother makes me "LABEL" them for her. so I put one in Blue--whose name starts with a B. And in pictures the boy whose name begins with an "L" is on the Left. And in their car seats "B" sits in the brown one. And the beds.."L"'s bed is on the left when you come in. OY VEY!!! I am a fraternal twin;blonde w/blue eyes. While my twin is dark haired,brown eyes. She in turn has twin sons; both blondes w/blue eyes. One of her other sons has a set of twins;fraternal with one being quite tall and the other much shorter. They don't even look like brothers. As for my sister's twin sons (my daughter was born on their first birthday!) well they are supposedly fraternal but look enough alike that 28 years later I have to look realy closely at them to determine which is which. My identical twin boys will be 14 this month. They have been a handful and a 'heartfull' since birth, never a dull moment wherever they are! They are charming, mischievious, never quiet, never still, prefer to operate 'outside the box' and I can't imagine life without them. Most popular quote from their teachers....."if it weren't for their really good manners...." Thank heavens for that! I have a set of step-sons who are twins. They are 7 now. Although I can tell them apart most of the time, they are definitely identical twins. None of my family or my husband's family can tell them apart. I have a twin sister and when we were little mom use to dress us up alike and i am just glad I was to little to understand what was going on. now that we are grown, we are the closest ones in the family. Your lucky to have twins and anyone who has a set of twins will tell you. they are SPECIAL!!!! I have a 17 y/o son and 8 y/o b/g twins. No they aren't identical but they do actually look alot alike in the face. They are built totally different with the boy being slim and the girl quite chubby. They were a surprise but wonderful addition to the family after 9 years of having an only child. I'm not the youngest Mom on the block by far but they are keeping me young at heart! It is amazing isn't it. My DD12 has brown hair/brown eyes, DS12 is blond and blue eyed and I STILL get that question. 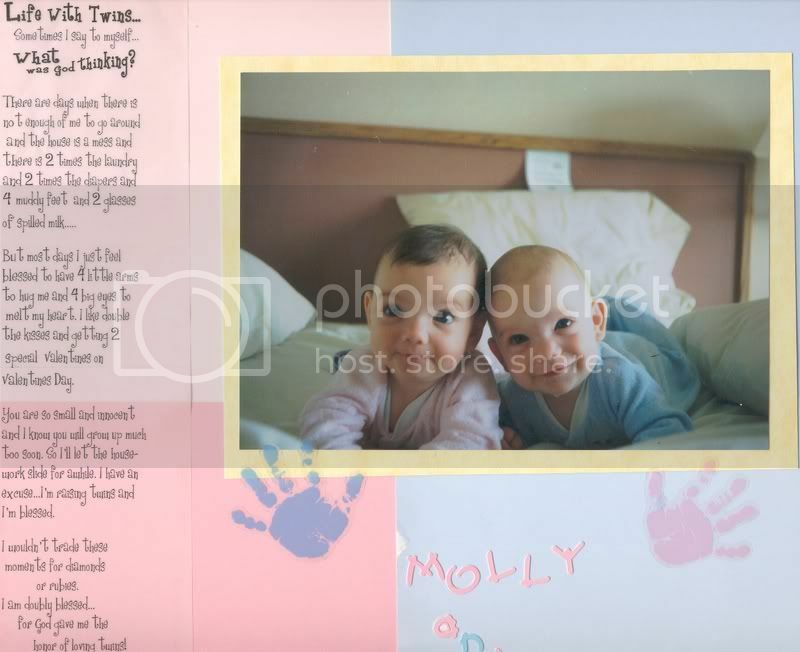 This is my favorite picture of them as babies--it is part of a scrapbook page I did.